Our Proud Working Rescued Dogs! 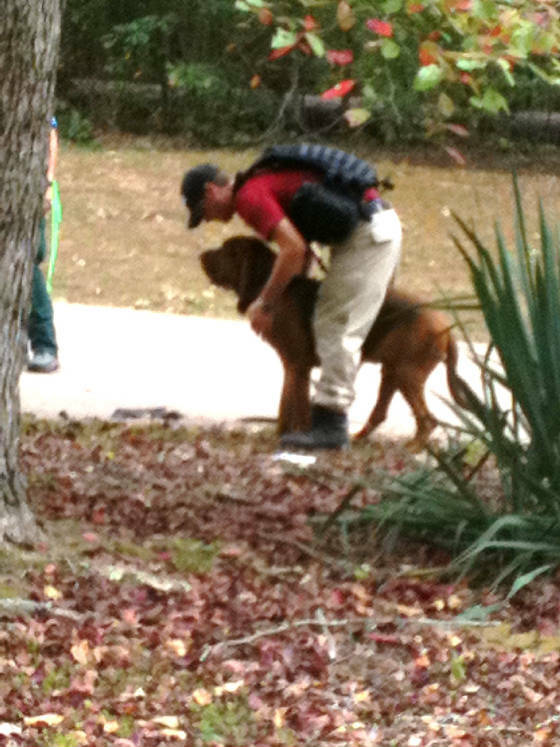 From being "Rescued" to Becoming a "Search And Rescue" Bloodhound! 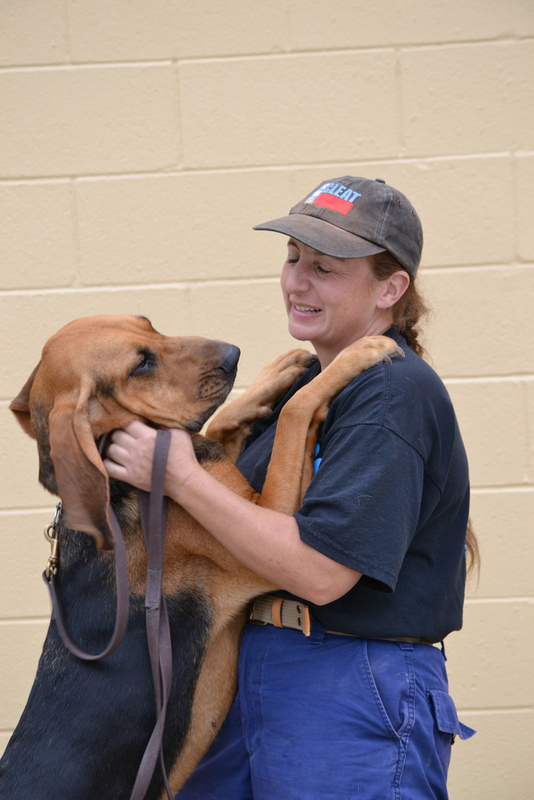 Welcome to our new page dedicated to our rescued bloodhounds that went from being saved from death to saving others by becoming a SAR Dog! When we rescue a bloodhound from a shelter, some come in very shy, scared, possibly abused and others come to us needing a job. 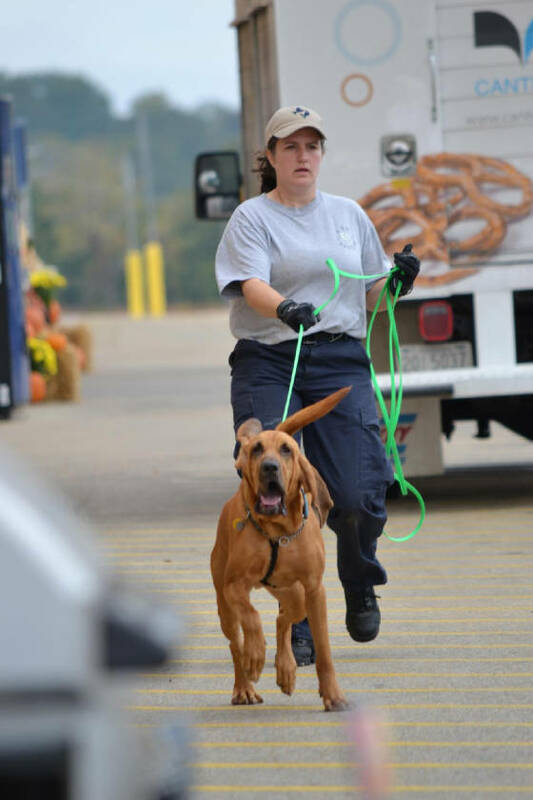 What I mean by this is that they have a very strong drive to become a trailing bloodhound and some become a SAR ( Search And Rescue dog) that are trained to work with K-9 Search Teams and some work in Police Departments as part of their K-9 Unit. 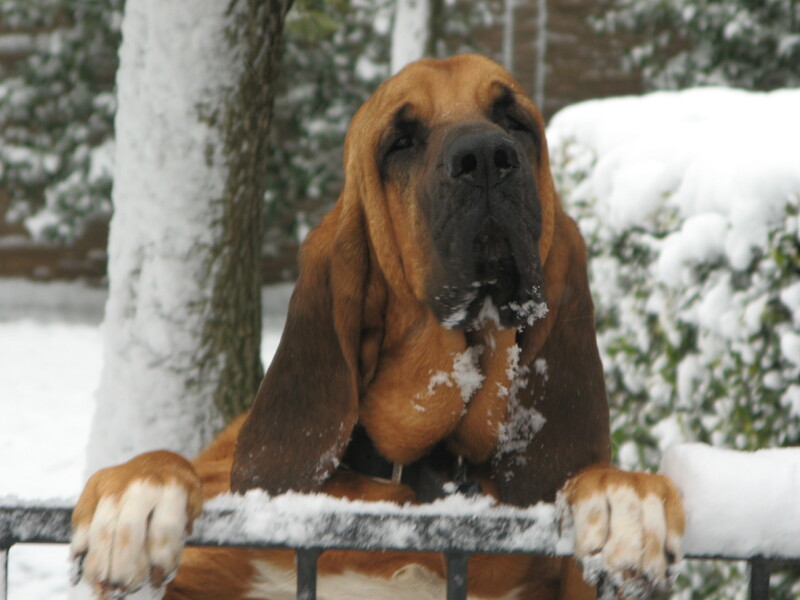 We evaluate each bloodhound that comes in to see which type of home (meaning a working home or a pet home) would be a better fit for each dog. Some do not have the nerve strength and drive that it takes to become a working dog. Those are the ones that are adopted into a family home to be just a family pet. Here are some of the ones that were chosen to become working dogs that we are so very proud of! Adopted 6 months later by Officer Jeffrey Spencer of the Baytown Police Department, Houston,TX. Scooby came into rescue looking pretty bad, very skinny with sores on his body. Within a few weeks he looked like a new dog, shiney coat, skin issues all healed up and no more ribs and hip bones sticking out! In evaluating Scooby I noticed the very strong drive he had for trailing. We started working with him and just knew that he would make a great SAR dog. Baytown Police K-9 Department called me asking if I had any bloodhounds that had potential to become a working dog and of course I said Yes! So we set up a time for them to come to evaluate him while also evaluating some other bloodhounds in other areas & states. After meeting Scooby they had just one other bloodhound to go see and they said that they would let me know their decision. I told them that I was sure that they would be back for him soon! They next evening I got a call and sure enough, they told me that Scooby was the one that they liked the most and that they would be making that long 5 hour drive back to Louisiana to get him on Monday. Officer Jeffrey Spencer and his new partner Scooby have attended many training seminars and in less than a year have passed their certification for SAR! Scooby is now a full time working K-9 along with his owner on the Baytown Police Department K-9 Unit. Congatulations to Jeff & Scooby, May God keep you both safe Always! 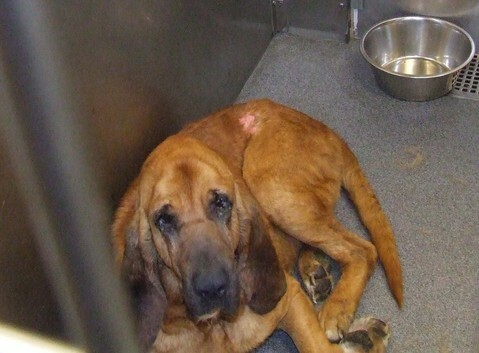 His 1st day in rescue, they had him listed as "The Sad Old Bloodhound", were they wrong! 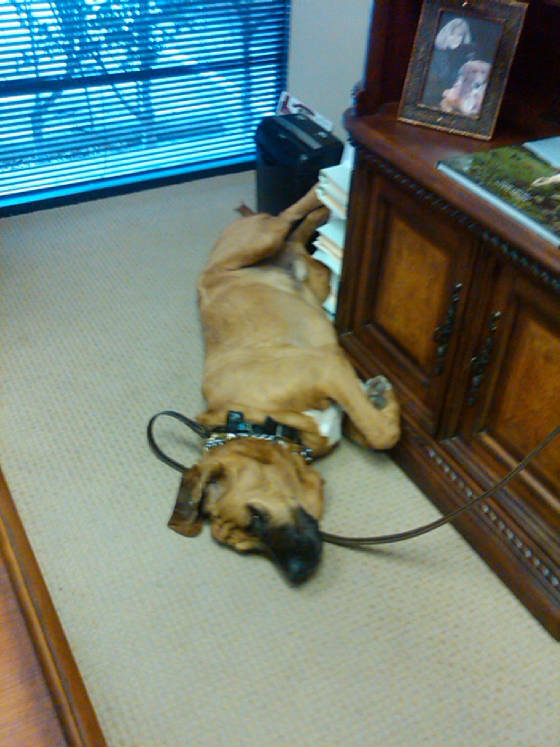 Pace was actually adopted by the vet that vetted him when he was rescued from the Dallas Shelter. Just a few weeks after being adopted, there was a tragidy in the family and he was returned. 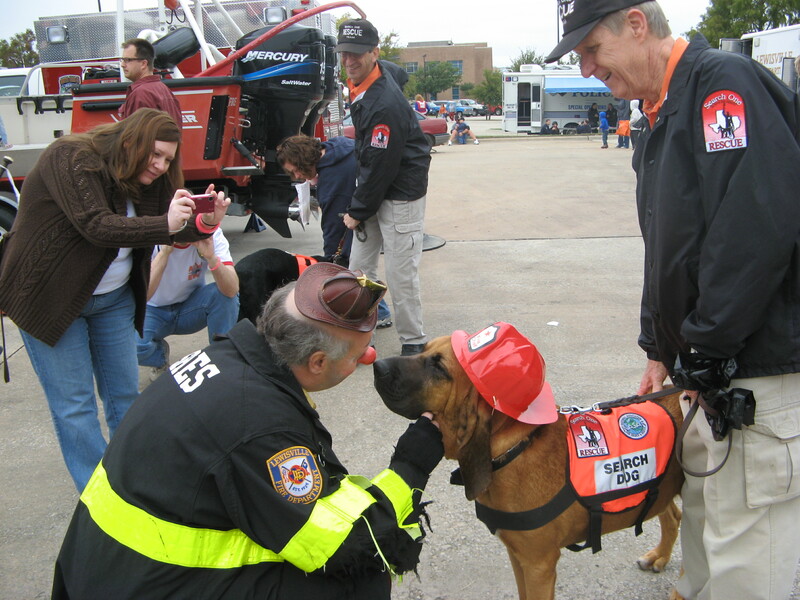 He was then adopted by his foster family that are with the Search One Rescue Team in Dallas, TX. After working with Pace and taking him to a few training sessions that their group does, they saw just how much potential that he had to become an SAR working dog. He was adopted by David & Sue Daniel of Plano,TX. This "Sad Old Bloodhound" wasn't sad anymore nor was he old. 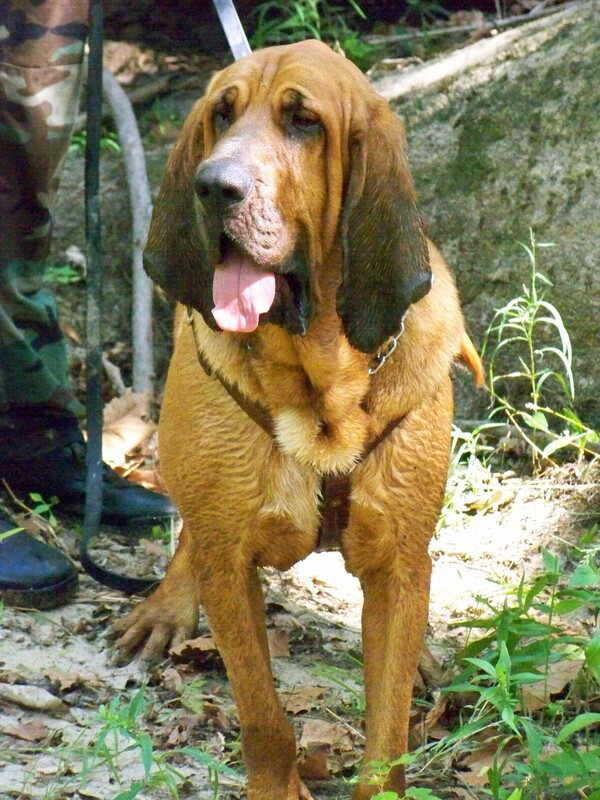 When bloodhounds are in poor shape it makes them look a lot older than what they truly are. Pace was only about 2 yrs old when we got him out of the shelter, he had skin issues and was heartworm positive. He is now very happy and healthy and a Great working dog! In being adopted by his new family he was also given a new formal name, Pace Bouche'! Pace has turned into one of the most phenominal dogs that Sue & David have ever owned. 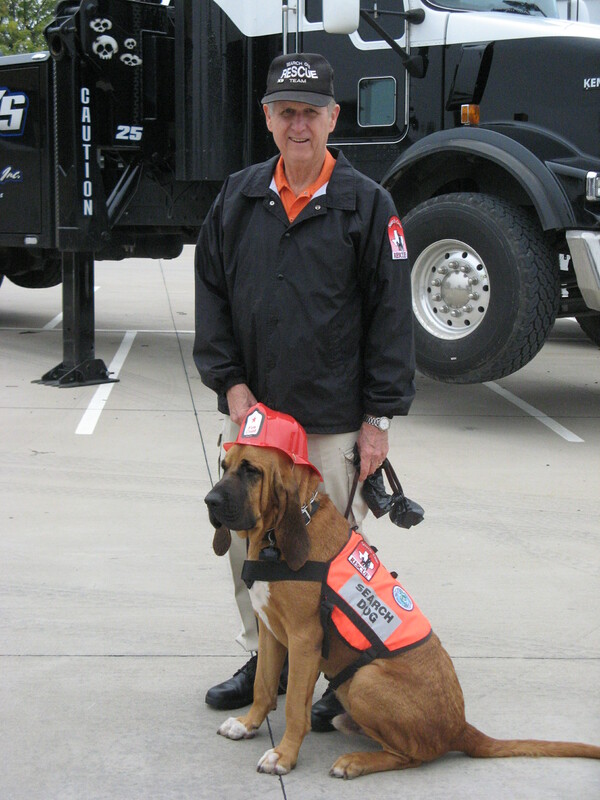 He has completed his SAR training and is a Certified SAR Bloodhound on the Search One Rescue Team in Dallas! 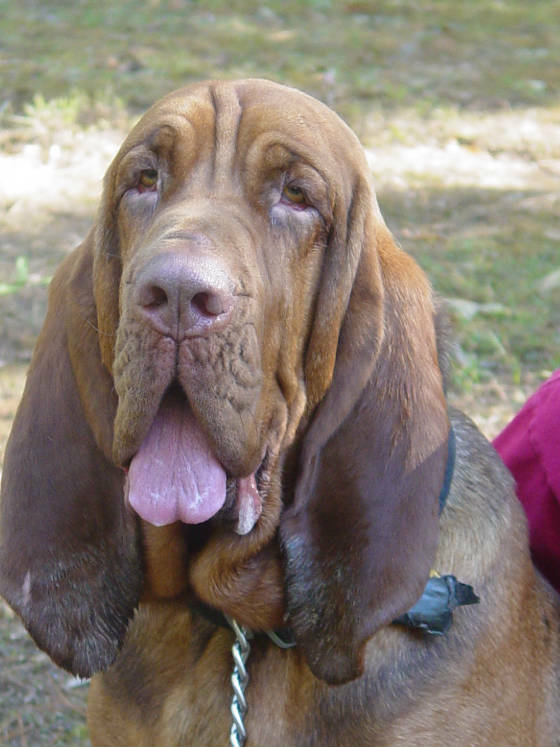 This is what the "Sad Old Bloodhound" looks like today! 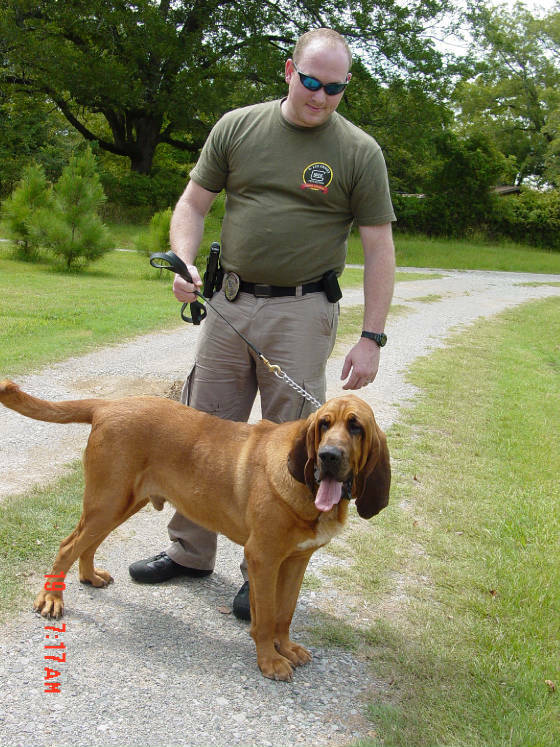 He is one of many adopted working bloodhounds that the Daniel's have owned! God Bless you both for giving them a chance at having a wonderful life! Pace Bouche' also attends many fund raiser's in the Dallas area with his owner! He loves EVERYONE! This Phenomenal Guy does it again! 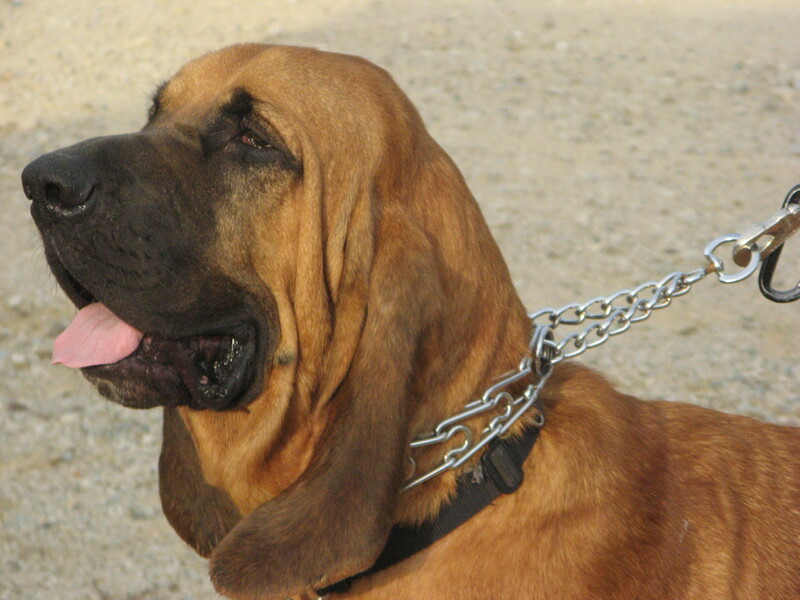 Pace Bouche' is one of THE most remarkable bloodhounds that has ever lived! 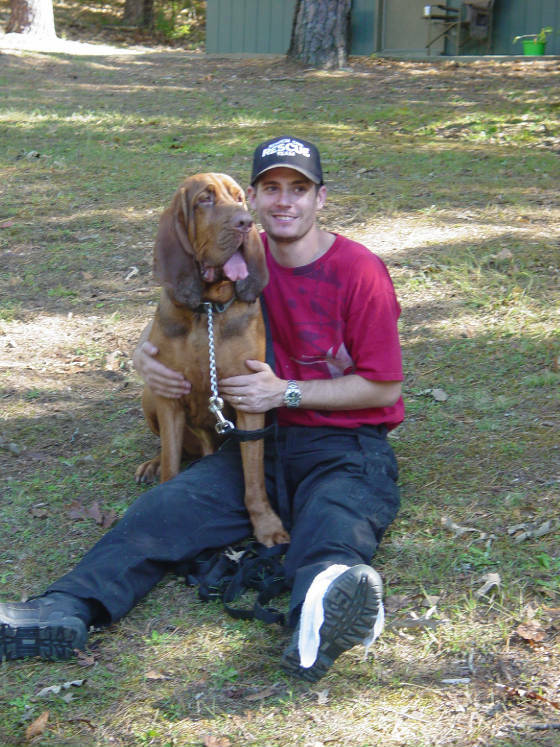 This dog and his owner/trainer David Daniel are a "Team" second to none! The case is still being investigated so I cannot get into much detail but check your online news for the Dallas area that has to do with the "Search One Recue" and finding a missing child AND just who lead them to the person of interest that is now in custody! Just to show you how determined this dog is, take a look at these pictures of Pace & David working a trail at their annual seminar! 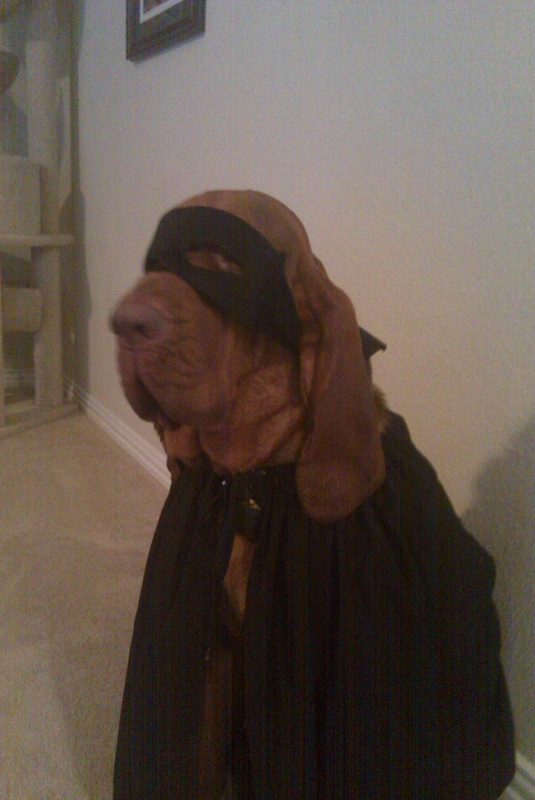 Now, does this look like a Sad Old Bloodhound to you? Bailey's 1st day in rescue, he was in rough shape. Bailey came to me as a stray from south west Oklahoma. He was so thin as you can see and had erlichia, a tick virus. He was such a sweet young guy, only about a year old. 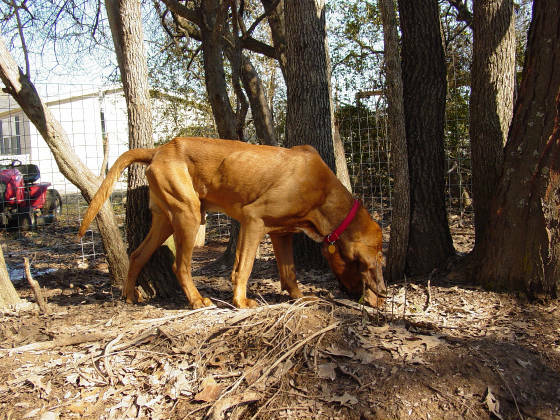 He is a liver and tan bloodhound which isn't usually the 1st choice in color for most people. He also didn't know much about walking on a leash when he got here and was quite a handfull! While teaching this boy some manners and how to walk nicely on the lead Bailey showed a very strong working drive. So once I noticed this I just had to make sure to place him in a working home where he would be trained for SAR. Bailey was adopted into a wonderful home and was going to be trained along with his new owner for Search and Rescue. Look at this Beautiful young man today! 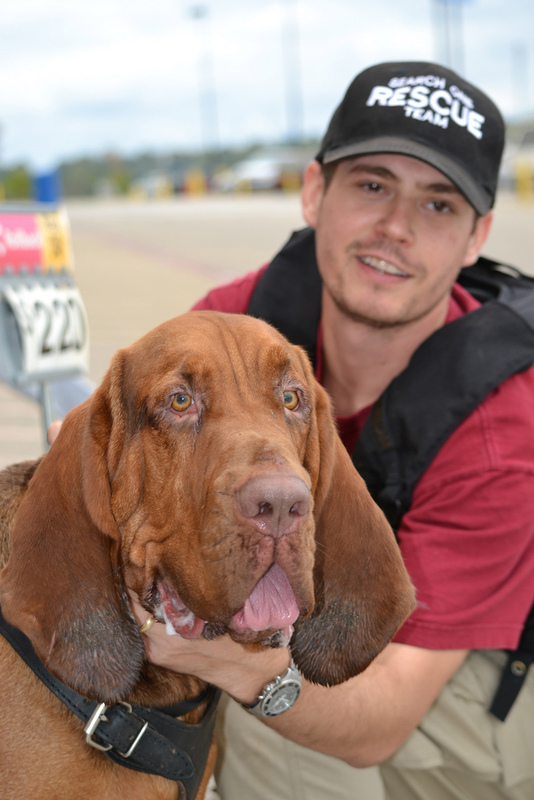 He is Gorgeous and is on the Search One Rescue Team in Dallas,Tx. This is Bailey & Stephen Clark his owner at a training seminar in Holly Springs, MS this past October (2011) where Bailey showed just how Great his nose truly is! 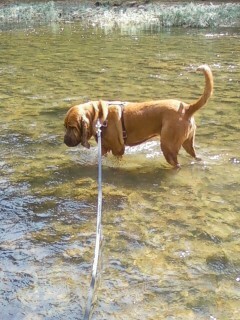 I was also there with a few other friends and their adopted bloodhounds. It was truly amazing to get to spend a week with the dogs that came from my home and their new owners but to watch them actually work was unbelievable! I also watched as they trailed for their certification! That was just Awesome! 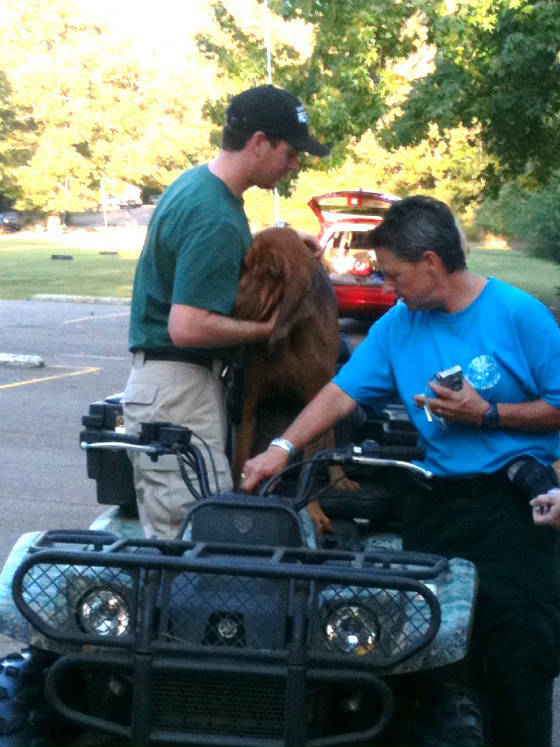 This is Bailey learning to get on the 4 wheeler in case this is needed for him to do during a rescue, he did Great! All the trainer kept saying all week long to Stephen is,"This dog will make you FAMOUS"! And we are all sure that he will! Bailey and Stephen got their certification during this training week! What an Awesome job they both did! I am so proud of you both! Here's Bailey taking a little time off for Halloween , being Zoro is too cool! Many More to Come! Asharah (Annabelle), Duke, Gypsy and Bella!